Three thoughts on the Utah Jazz’s 114-83 win over the Chicago Bulls from Salt Lake Tribune beat writer Andy Larsen. Here’s a fun fact: when the Jazz win, they have largest average winning margin of any team in the NBA. They win their wins by an average of 15.7 points per game (! ), bigger than the best teams in the NBA. Milwaukee is No. 2 with a 15.0 margin of victory average, and Golden State averages 14.0 points. You’d like to say that the biggest reason is that the Jazz put their foot on the throat of opposing teams, keeping their same level of play throughout wins, but to be honest, I don’t really think that’s the case. Tonight’s a good example: the Jazz got out to a 38-point lead by midway through the second quarter (!!) but then the margin just oscillated between 28 and 38 from there on out. In New York, the same thing happened. Here’s my hypothesis: the Jazz are just too smart for dumb, bad teams. The Bulls are one of them, IMO. They attack only one way: directly at the basket, with little care for whether or not there happens to be the best interior defender in the league down there. That results in a lot of blocked shots and even more wild mid-range stuff that has no chance of actually going in. Essentially, every healthy player on the Bulls essentially had one skill: Shaq Harrison and Antonio Blakeney are theoretically drivers, Kris Dunn theoretically has a midrange game, and Robin Lopez is only good inside. With no wrinkles, the Jazz can just cover these things, and get the job done. On offense, I think the situation is similar. If you know what the defense is going to do, and they don’t have any dangerous, adaptive defenders, really, all you have to do is make the right read. That’s easier said than done, but the Jazz are so good at passing and generally so good at making the right play that that’s going to result in a lot of open shots. Sometimes, the players don’t make them, but sometimes they do. Hopefully, your defense is good enough to win you some of the “missing them” games. Anyway, tonight’s game gave us plenty of time to be philosophical about these sorts of things, as the Jazz ran up just ridiculous margins early to an increasingly anxious United Center crowd. Is 36-18 or 52-24 or 68-30 the most embarrassing score of the night? Eh, whatever. It’s a win. The unfortunate part of beating a team by 38 points in the middle of a second quarter is that it becomes a little bit harder to appreciate beautiful basketball. When the dead horse is being beaten, the artistry of the technique used is not a matter of huge importance. We’re going to try to be impressed anyway. This play was pretty insane to me: the Bulls played nearly a full possession of solid defense. With just five seconds left on the shot clock, Derrick Favors sets a screen for Joe Ingles. Ingles passes it to Favors rolling to the rim, who kicks it to Raul Neto, who kicks it to one of the best 3-point shooters of time in Kyle Korver. Remarkably, he still had 2.5 seconds left on the clock, it wasn’t rushed at all. That he missed the shot is a bummer, but the Jazz went from having nothing at all to having the best shot possible pretty much instantly. Or here, Korver comes off a screen, tries to find Favors rolling to the rim. Cristiano Felicio does a good job of getting in the way of the easy pass, so instead, Korver has to put a little touch on the one towards the basket for the dunk. This play will be noticed; if this game makes SportsCenter, it’ll be the play you see. But it was legitimately cool: the Gobert block, the Jae Crowder behind the back, the Ingles assist to the Donovan Mitchell dunk. Still, good stuff is good stuff. This was some good stuff. One interesting thing Quin Snyder told me when I asked him about Jae Crowder’s recent play is that he’s started to use him more of an initiator or playmaker in the Jazz’s offense. 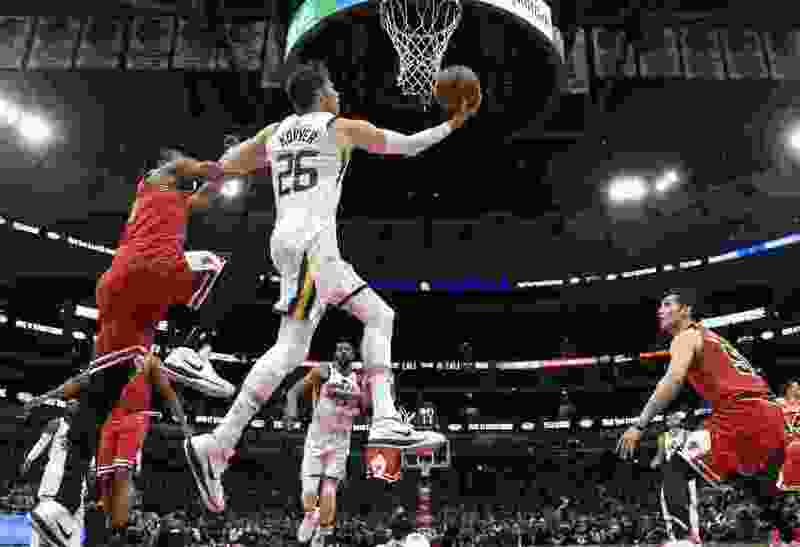 Some of that came about by necessity, when the Jazz didn’t have any point guards to play, but Crowder took to it well enough that they’ll now have him dribble the ball up the court and get things started more than they used to. Here’s an example. The Bulls have a terrible turnover, because they are who they are. But immediately, Snyder senses an opportunity, looking at the scoreboard to see how much time is remaining, then calling a play to try to take advantage of the 2-for-1 opportunity. At first, it’s Joe Ingles who goes to get the ball from out of bounds, but with the extra second, Snyder takes the time to call a “peel” play, where Ingles starts in the corner to come get the ball. The idea: he’ll be able to come off the cut, get the ball with an advantage, and immediately be able to shoot or maybe hit Favors on the roll. Either way, the Jazz will be able to get off a shot in the first 10 seconds or so. It works really well, partially because of a nice cut where Ingles fakes going over the top with Crowder, then goes under, and partially because of some yakety-sax inducing defense by the Bulls. But even against decent defense, the idea was a good one. I don’t think it works as well if it’s Neto initiating this, for a couple of reasons. Crowder’s defender is probably less used to helping off on the perimeter if things go as they did, preventing a simple help onto Ingles to prevent the shot or help bottle the pick and roll. And because Neto is a better 3-point shooter, his defender is more likely to stay attached to him in the corner if the play would have gotten to the pick-and-roll phase. Using Crowder this way is only a wrinkle, not something you want to rely on, but it has the potential to confuse defenses enough to get something going.